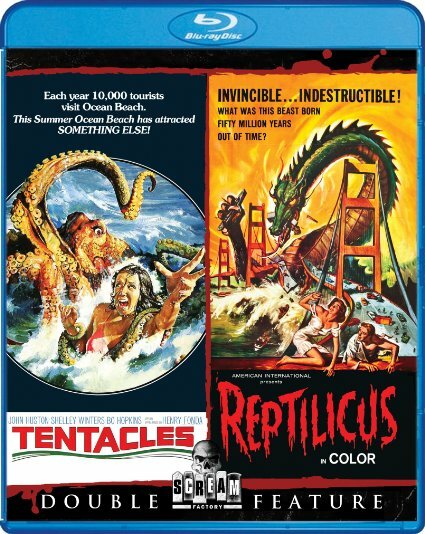 Schlock-Wire: Scream Factory Doubles Up On Monsters With A Blu-Ray Two-Fer Of TENTACLES And REPTILICUS – Schlockmania! Discover the true meaning of survival of the fittest, as a terrifying creature from the past brings the future to its knees! Packed with thrills, chills and prehistoric spills, Reptilicus proves that “if cats have nine lives, monsters have even more” (Citizen News)! Directed by Sidney W. Pink (writer and producer of the cult films The Angry Red Planet, Pyro), Reptilicus is a spine-chilling creature feature about a cold-blooded 90-foot killer whose time has come… again!